From Copenhagen’s perspective, the relationship is expensive (at 700 million USD per annum), cumbersome, undermined by a troubled history, and pervaded by a guilty conscience. The Danes stay put because their presence in Greenland is part of Copenhagen’s fastidious strategy of maintaining the status quo in the High North. Greenland is not a strategic goal in itself but a bargaining chip that will give Denmark much-needed political muscle in the Arctic summits that will take place in the years to come. In general, the Danish strategy has three prongs: 1) performing a theater of sovereignty; 2) establishing efficient regional security governance; and 3) keeping others out. For some, the first prong has been misunderstood as the militarization of Greenland. The Danish government, however, understands that sovereignty depends on performing certain rituals, which means a military presence on land and sea. One of the more interesting examples of this is the Sirius Patrol — a Husky dog sled unit which (if largely symbolically) is already enforcing Danish sovereignty in the most distant reaches of Greenland. Furthermore, Copenhagen recognizes that its ability to maintain sovereignty over Greenland and preserve the status quo in the Arctic will require full dedication to regional cooperation should the bigger countries become more ambitious or assertive. Unlike Russia and the US, who remain hesitant to strengthen regional institutions, Denmark is dedicated to most types of regional cooperation. Ironically, this leads to the third prong of the Danish Arctic strategy. If possible, Denmark aims to keep outside powers like the EU, NATO and the other circumpolar states out of the Arctic governance architecture — both out of fear of institutional inertia and as a way of ensuring Danish influence in those institutions. This was perhaps most visible at the 2008 Ilulissat Summit, where Iceland, Finland, and Sweden (all members of the Arctic Council) were bullied into not participating, resulting in loud protests from these countries. One notices a similar focus in Norway’s strategic vision. Last week, Norwegian Foreign Minister Støre announced that “If we are to be able to develop the Barents Sea as a new energy province, we must have the necessary technology to operate in vulnerable Arctic areas. Today, the Ministry of Foreign Affairs announced NOK 6 million in funding to a Norwegian–Russian project that will assess the gap between the technology currently available and the technology needed for extracting oil and gas.” This announcement consolidates what appears to be the foundation of Oslo’s Arctic Policy: dense public-private cooperation with Russia. On the issue of the military, the Government is candid about its aim of increasing the Norwegian military presence in the region. One purpose of the increase is to help enforce international obligations: “By taking action on breaches of the rules designed to protect natural resources, Norway is making it clear that international and national obligations are to be taken seriously.” Another is to enable Norway to exercise its sovereignty and to monitor civil and military movements in this disputed part of the world. To this end, the Norwegians also aim to introduce a maritime surveillance system for the High North, called “Barents Watch”. The message here is clear: infringements and violations of national rights will not be tolerated on Norway’s watch. The document ends by announcing that the time has come to put words into action. 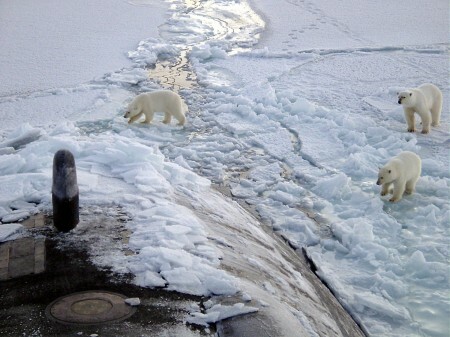 Where, then, does this leave Carl Bildt and Swedish Arctic policy? Sweden’s strategic vision is the most recent of the three and is perhaps best understood in light of the undeniable nationalistic flair of the policies of its two Scandinavian neighbors. Of the three countries, Sweden is –unsurprisingly– the one whose Arctic vision falls most in line with the pledges of regional solidarity. Despite being an Arctic state, Stockholm’s goal is to get other states to see the Swedish position as “a starting-point for the further development of cooperation” in the region, with Sweden functioning as a moderator between those more directly involved. Deeper cooperation can be achieved by adopting a broader concept of security in which cooperation is included. By this the Swedes mean that developments in the High North should be governed by a common security policy for EU Member States and Nordic countries alike. To this end, Sweden will “actively contribute” to the development of an EU policy on the Arctic. Bildt’s agenda of Arctic multilateralism was first articulated during the Swedish Presidency of the EU in 2009 when he pushed for the European Commission to be a permanent observer in the Arctic Council. Moreover, Sweden is fully intent on bringing this perspective to bear during its presidency of the Council itself from 2011-2013. One tactic the Swedes are using is to increase knowledge and awareness about Arctic issues in the wider public. The Swedes’ relaunch of the Arctic Council website is one step in this direction. By contrast with Danish and Norwegian attitudes, the Swedes think existing institutions like the Council should be more prominent in this politically and ecologically sensitive part of the world. Through ecological and climatological research, Sweden is also pushing its soft power in the region. This completes a picture of Swedish Arctic policy consistent with its general foreign policy line, which stresses multilateralism, norm-entrepreneurship and the desire to be a world leader in promoting the “higher ends” of world affairs. The bewildering changes taking place up north drives these states’ foreign policies and makes them more assertive. To my mind, we are not dealing with change, as some would have it, but enforcement. One cannot help but be struck by how “the Arctic” has had the unexpected effect of crystallizing the foreign policy doctrines of each respective country. The Arctic, if you like, puts each national disposition on steroids and highlights the realist idea that capabilities are the “alpha and omega” of foreign policy. One striking observation is that each country conforms quite closely to its national stereotype: the Norwegian policy is driven by petroleum, the Danish policy by various inferiority complexes, and the Swedish policy by a naïve Puritanism. A wider theme in the region that needs to be further explored is the uneasy relationship between regional solidarity and national self-interest. In any event, developments in the High North suggest a new and exciting chapter in Scandinavian foreign policy. Re “online sources”: “Arctic Centre at the University of Lapland, Sweden”: probably wrong country. And: no Nordic aspect as a whole,, only Scandinavia! This is an interesting analysis which adds important perspective to the Arctic policies of the Scandinavian governments. On the Danish approach, however, you would probably need to put some nuance on your claim that Denmark’s aims in particular to keep all non-Arctic players out of the Arctic. This was certainly true, as you rightly state, back in 2008, when our government invited the five Arctic coastal states to Greenland, where they issued the famous Ilulissat-declaration, stating among other salient points, that the Arctic Ocean is already sufficiently protected through existing international treaties and the good wills of the coastal states – and that therefore there is no need for furhter international regulation. A point hotly contested by environmentalists and non-arctic policy makers, who look to the succesfull legal protection of the Antarctic environment, where international regulation is constantly being strengthened, no oil drilling is allowed etc. Today, however, you would probably want to add that Denmark has recently emerged as probably the most active proponent of a stronger Chinese say in the Arctic. Some argue that this is based on a cynical wish to expand Danish business interests in China, trade and so forth, but it would probably be more fair to include also the fact that Denmark (unofficially) finds that the Chinese claim to a seat as permanent observer within the Arctic Council is founded on fairly good arguments that developments in the Arctic does impact significantly on China – climate change, new trading routes to North America and northern Europe, energy ressources, security issues etc. Likewise, Denmark seem to support (at least unofficially) the EU’s claim to similar status. Denmark during its presidency of the Arctic Council spend considerable time trying to fix a compromise within the Arctic Council on this issue, but failed due to strong opposition from – reportedly – Russia, Canada and others. There is a fine distinction here between on the one hand opposing new, additional international regulation – a new international Arctic Treaty for instance – as Denmark did very actively in 2008 and would do again tomorrow if need should be; and then on the other hand opening up the Arctic political arena to states who promise to accept the Arctic states as the legally entitled prime movers, shakers and oil-producers!